Disease recurrence has been reported in up to half of patients undergoing radical cystectomy for bladder cancer. Various regimens have been outlined for surveillance of patients following surgery, often with disparate recommendations regarding the intensity of follow-up and the choice of imaging. Moreover, debate exists as to whether routine oncologic follow-up in fact impacts patient survival. Currently, the best predictors for metastases remain pathologic tumor stage and lymph node status. Common sites of bladder cancer metastases include the thoracic cavity, peritoneum, liver, bone, and, less frequently, isolated to the pelvis. The majority of recurrences have been documented within the first 2–3 years after cystectomy. Patients do remain at long-term risk for metachronous tumors of the upper urinary tract, and may benefit from risk-stratified surveillance with imaging and cytology. Meanwhile, urethral recurrence after cystectomy is relatively infrequent. 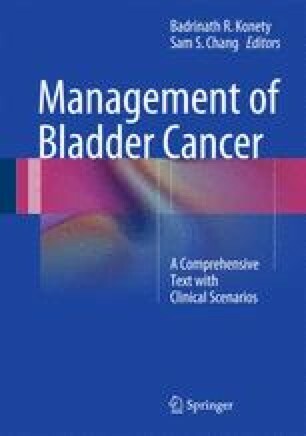 Conflicting evidence has been reported regarding the benefit of routine screening with urethral cytology, and as such guideline recommendations are inconsistent but do suggest a risk-adapted strategy, targeting patients with pathologic evidence of prostatic tumor involvement at surgery who have been found to have the highest risk for urethral recurrence. In addition, given the metabolic abnormalities that may occur following urinary diversion, including in particular renal function decline, continued functional surveillance in these patients is recommended to facilitate early detection and management of such complications.